Last week, the currency interest rate rebounded, with the R007 average rising to 2.56% and the R001 average rising to 2.24%. DR007 went up to 2.54% and DR001 went up to 2.17%. Last week, the open market did not have funds due, the central bank once again suspended the reverse repurchase operation, and the open market funds were zero. Last week, the US dollar index fell slightly, the RMB remained stable against the US dollar, and the onshore and offshore RMB exchange rates were stable at 6.71. Last week, the central bank announced that the newly added social financing in March was 2.86 trillion yuan, which exceeded expectations. The growth rate of the social welfare industry indicates that the future economy is expected to bottom out. Coupled with the obvious rebound in inflation in March, it means that the need for further easing of the central bank's monetary policy has dropped significantly, and the probability of future RRR reduction may be significantly weakened. Overseas: The United States and Europe threaten each other to impose tariffs.IMFLower global economic expectations.Last Tuesday, US President Trump claimed to impose tariffs on the EU's $11 billion worth of products. On Friday, the EU said it might impose tariffs on US goods. The minutes of the Fed’s March meeting showed that participants agreed that there is a high degree of uncertainty in the economic outlook, moderate inflationary pressures, and patience in raising interest rates. Last Tuesday, the IMF cut its 19-year global economic growth forecast from 3.3% in January to 3.3%, the lowest since the 2008 financial crisis. Last Wednesday, the European Central Bank maintained its maininterest rateNo change, the statement did not mention the details of the targeted long-term refinancing operation. economic:4The monthly economy is stable.In March, China's export growth rate rebounded to 14.2%, mainly due to the low base in the same period last year. The export growth rate in the first quarter was less than that in the whole year of 18 years. In the context of the overseas economic slowdown, the overall export is still weak. 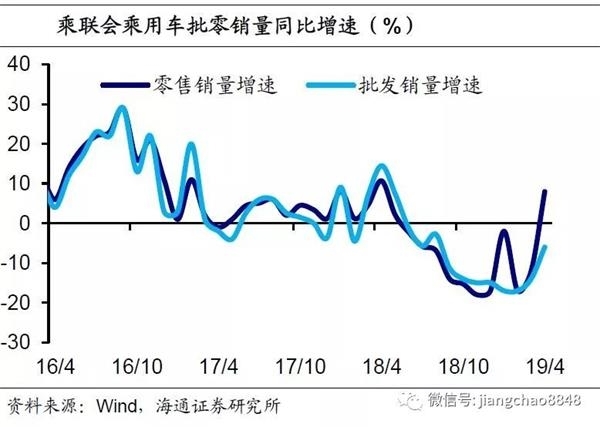 In March, China's import growth rate fell back to -7.6%, exports improved substantially and imports continued to fall, resulting in a significant rebound in the surplus. In the first ten days of April, the growth rate of 38-city real estate sales rose to 33%. In the first week, the growth rate of wholesale and retail sales of passenger cars was -6% and 8% respectively, which was also significantly improved compared with March, pointing to a rebound in demand in April. Last week, the operating rate of blast furnaces continued to rise to 69.5%. 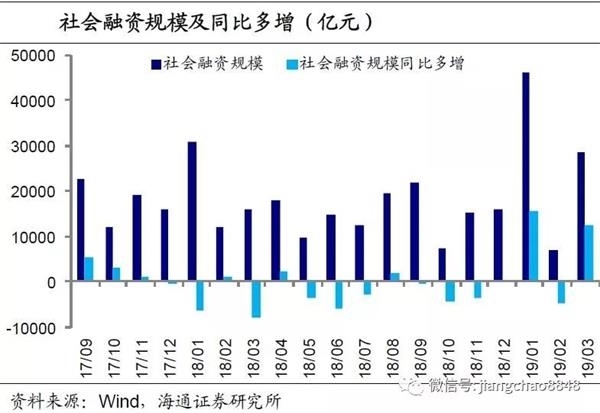 In the first 12 days of April, the growth rate of coal consumption by the six major groups fell to 0.8%, but it was still better than the negative growth in January and February, and the production was mixed. Price: The inflation trend is different.Food prices have continued to rise since April, we expect AprilCPIOr continue to rise to 2.6%. Coal price, steel price,Oil priceSmall increase, but considering the VAT rate is lowered, we predict AprilPPIThe month-on-month was flat, and the April PPI rose to 0.6% year-on-year. Both CPI and PPI rebounded in March, but looking ahead, inflation may tend to differentiate. Among them, benefiting from tax cuts driving up consumption growth and rising pig prices, CPI may continue to rise moderately. On the PPI side, the PPI may re-enter after May due to insufficient investment recovery. Liquidity: The probability of RRR reduction decreases.Last weekcurrencyinterest rateThe rebound, in which R007 average rose to 2.56%, R001 average rose to 2.24%. DR007 went up to 2.54% and DR001 went up to 2.17%. Last week, the open market did not have funds due, the central bank once again suspendedRepoOperation, the open market funds are zero. Last week, the US dollar index fell slightly, the RMB remained stable against the US dollar, and the onshore and offshore RMB exchange rates were stable at 6.71. Last week, the central bank announced that the newly added social financing in March was 2.86 trillion yuan, which exceeded expectations. The growth rate of the social welfare industry indicates that the future economy is expected to bottom out. Coupled with the obvious rebound in inflation in March, it means that the need for further easing of the central bank's monetary policy has dropped significantly, and the probability of future RRR reduction may be significantly weakened. Policy: The household registration reform has increased.The National Development and Reform Commission issued the "Key Tasks for New Urbanization Construction in 2019", proposing that the type II big cities should completely cancel the restrictions on settlements, and the type I large cities should fully open and open the conditions for settlement. The Prime Minister delivered an important speech at the Eighth China-Central and Eastern European Countries Leaders' Meeting: China is willing to share China's development opportunities with 16 countries and foster new kinetic energy for "16+1 cooperation." The Standing Committee of the Jiangsu Provincial Party Committee held a meeting to require a policy for the classification of the chemical industry. Enterprises and parks that do not meet the safety production standards must be closed. Enterprises and parks that fail to meet environmental standards must be shut down. Last Tuesday, US President Trump claimed that the United States will have a negative impact on the United States because of the EU’s subsidies to Airbus.110Billions of dollars of products are subject to tariffs.On Friday, EU diplomats said that the European Commission had drafted a list of imported US goods worth about 20 billion euros, possibly adding tariffs to them, in response to the USBoeingSubsidy. On the same day, the EU agreed to vote on April 15 on whether to authorize the European Commission to start trade negotiations with the United States. Federal Reserve released3Minutes of the monthly meeting.The minutes of the Fed’s March meeting released last Wednesday showed that participants agreed that there is a high degree of uncertainty in the economic outlook, moderate inflationary pressures, and patience in raising interest rates. Most officials believe that the economic outlook and related risks may not raise interest rates this year. Some officials believe that if the economic growth rate is higher than the long-term trend, it may be suitable for raising interest rates during the year. Fed officials expect the US economy to continue to expand in the next few years, and patience with monetary policy is due to uncertainty, and historical experience has presumed that the yield curve is upside down, indicating that economic weakness is not necessarily reliable. last Tuesday,IMFwill19The global economic growth rate is expected by1Month3.5%Down to3.3%For the 2008 financial crisis since the new low. By country, the IMF raised its forecast for China's growth rate in the 19-year period from 6.2% to 6.3%, the US growth rate is expected to be lowered from 2.5% to 2.3%, and the euro zone growth rate is expected to be lowered from 1.6% to 1.3%. Despite the weak global economic growth in early 19th, the IMF expects growth to rebound in the second half of the year. The supporting factor is that major economies can implement large-scale easing without inflationary pressures. European Central Bank4The monthly meeting kept interest rates unchanged.In the interest rate decision issued by the European Central Bank on Wednesday, the main interest rates were maintained unchanged, in line with market expectations, and the statement did not mention the details of the directional long-term refinancing operation (TLTRO). European Central Bank President Mario Draghi warned the euro zone's economic risks at a press conference after the meeting, but expected the possibility of a recession is low. If the statement is necessary, the ECB can use all the tools and said it will communicate TLTRO in the future. Specific details. Export growth rate improved.In March, China’s dollar-denominated exports rebounded to 14.2% year-on-year (previous value - 20.7%). Due to the characteristics of foreign trade enterprises "concentrating exports before the Spring Festival, importing first after the holiday, and gradually recovering from exports", last year's Spring Festival late last year was significantly dragged down by exports, with a low export base and less impact on imports, so it was exported in March this year. Year-on-year jump. In the first quarter, China's exports increased by 1.4% year-on-year, a slight increase from the growth rate in December of 18 years, but not as the cumulative growth rate in the past 18 years. 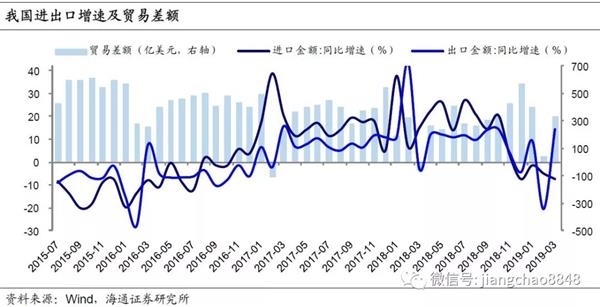 This shows that after the Spring Festival disturbance was removed, the export only improved slightly, and the overseas economy slowed down. In the background, the overall export is still weak. External demand has rebounded.From the perspective of countries and regions,In March, China's export growth rate to the United States (3.7%), the European Union (23.7%) and Japan (9.6%) all rebounded significantly. Among emerging economies, the growth rate of exports to ASEAN (24.8%), South Korea (6.7%) and India (8.0%) turned positive, and the decline in export growth rate of Hong Kong (-0.9%) in China narrowed.Overall, the first quarter,In the context of trade friction, China’s total exports to the United States decreased by 9.0% year-on-year in January-March, while exports to the EU and ASEAN increased by 8.1% and 9.1% respectively. Imports continue to fall.In March, China's imports continued to fall to -7.6% (previous value -5.2%), confirming that demand in March is still weak.In terms of quantity,In March, China's imports of soybeans (-13.1%), iron ore (0.7%), copper (-11.1%) and integrated circuits (-5.3%) increased slightly compared with the previous month, but imported crude oil (0.4%) increased. The sharp drop in speed is the main drag on imports.From the amount,The price of iron ore rose year-on-year, and the value of imported iron ore (17.5%) rebounded sharply year-on-year, while the growth rate of imported crude oil (1.5%) declined.From the cumulative growth rate,1-3Monthly import value-4.8%Continued18year12Negative increase since the month. The surplus has clearly rebounded.In March, China’s exports improved sharply and imports continued to fall. The trade surplus expanded to US$32.64 billion. The cumulative surplus in January-March was US$76.3 billion, a significant improvement from the same period last year. In the first quarter, China’s trade surplus with the United States was 62.5 billion US dollars, higher than the 58.3 billion US dollars in the same period last year. However, as the Sino-US trade agreement approaches, China may increase its procurement of the United States. In the future, China’s trade surplus with the United States will decrease. At present, the US surplus accounts for about 80% of China’s total surplus, and the overall external demand slows down. China’s surplus still remains. There is pressure to contract. estate,Car sales have improved.In the first ten days of April, the growth rate of 38-city real estate sales rose to 33%. On the one hand, the impact of the low base in the same period last year still exists. On the other hand, the relaxation of some urban settlement policies will also push up the demand for housing in the short-term. The city's sales rebounded synchronously but the differentiation was still obvious. The first- and second-line situation was better than the third-fourth line. In the first week of April, the growth rate of passenger car wholesale and retail sales was -6% and 8% respectively, and the growth rate was significantly improved compared with March. The start of blast furnaces continued to rise, and the growth rate of coal consumption for power generation declined.Last week, the operating rate of blast furnaces continued to rise to 69.5%. Over the same period of 18 years, the short-term suppression of production at the end of the environmental protection may be gradually eliminated. In the first 12 days of April, the fuel consumption of the six major groups increased by 0.8% year-on-year, which was a significant decline from March, but still better than the negative growth in January-February. Last week, pig prices, poultry prices, egg prices, and vegetable prices rose slightly. The price of aquatic products fell, and food prices rose by 0.5%. Due to the sharp increase in pig prices, the CPI in March was pushed back to 2.3%. Food prices have continued to rise since April, and we expect CPI to continue to rise to 2.6% in April. In March, the PPI rose by 0.1% from the previous month and rebounded to 0.4% year-on-year. Since April, coal prices, steel prices, and oil prices have risen slightly. However, considering that the VAT rate is lowered and the prices are lowered, we predict that the PPI will be flat in April, and the PPI growth in April will rise to 0.6%. Both CPI and PPI rebounded in March, but looking ahead, inflation may tend to differentiate. 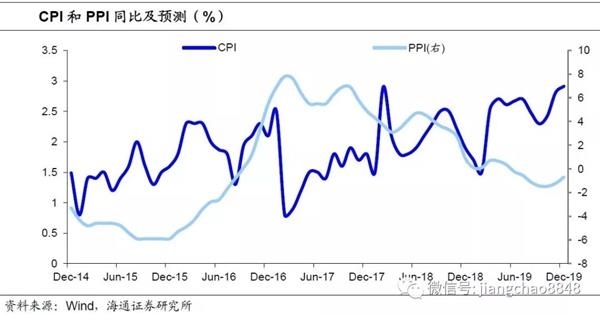 Among them, benefiting from tax cuts driving up consumption growth and rising pig prices, CPI may continue to rise moderately. On the PPI side, the PPI may re-enter after May due to insufficient investment recovery. Last week, the monetary interest rate rebounded sharply. The average value of R007 was 17bp to 2.59%, and the average R001 was 35bp to 2.24%. DR007 uplinks from 20bp to 2.54%, and DR001 uplinks from 34bp to 2.17%. Last week, the open market did not have funds due, and the central bank once again suspended the reverse repurchase operation, and the open market funds were zero. Last week, the US dollar index fell slightly, the RMB remained stable against the US dollar, and the onshore and offshore RMB exchange rates were stable at 6.71. Last week, the central bank announced that the new social financing in March was 2.86 trillion, far exceeding expectations, while the growth rate of M2 rebounded to 8.6%. The steady growth of social welfare indicates that the future economy is expected to bottom out. Coupled with the obvious rebound in inflation in March, it means that the need for further easing of the central bank's monetary policy has dropped significantly, and the probability of future RRR reduction may be significantly weakened. The reform of household registration has increased.The National Development and Reform Commission issued the "Key Tasks for New Urbanization Construction in 2019", and proposed that the type II large cities with a permanent population of 1 million to 3 million in the city should completely cancel the restrictions on settlement. The large-scale I-type cities with a resident population of 3 million to 5 million should be fully liberalized. Relaxation of settlement conditions and comprehensive cancellation of restrictions on the settlement of key groups. The intensity of household registration reform has increased significantly than before. The speed of agglomeration of large cities and megacities may accelerate, and the proportion of urban and urban populations in the total urban population will further increase. China cooperates with Central and Eastern Europe.The Prime Minister delivered an important speech at the Eighth China-Central and Eastern European Countries Leaders' Meeting: China is willing to share China's development opportunities with 16 countries and foster new kinetic energy for "16+1 cooperation." The next steps of cooperation include: First, jointly safeguard the multilateral trading system. Second, further expand the scale of trade. Third, promote the "One Belt, One Road" cooperation. Fourth, vigorously expand innovation cooperation. Fifth, continue to promote cooperation in the construction of SMEs and industrial parks. Sixth, in-depth humanities exchanges and cooperation. Environmental protection and security efforts have increased.The Standing Committee of the Jiangsu Provincial Party Committee held a meeting to require the classification of the chemical industry and maintain the relative stability of the relevant policies; enterprises and parks that do not meet the safety production standards must be closed, and enterprises and parks that fail to meet environmental standards must be shut down. Low-end enterprises must be eliminated; enterprises that meet safety production and environmental protection standards must support technological transformation, support supporting industries, and support and improve the industrial chain; if the overall environmental capacity of the region is insufficient, it is necessary to make overall planning and adjustment, one enterprise and one policy, and targeted implementation. .